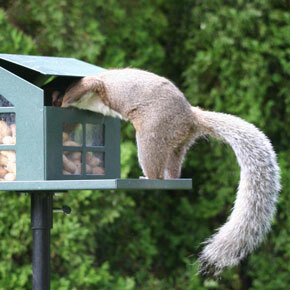 Tired of the squirrels stealing food from the bird feeders? Why not draw them away the bird feeders. 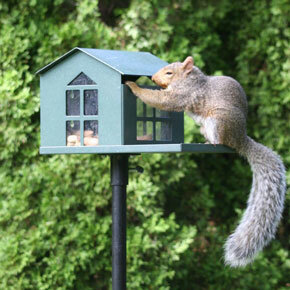 This solid, steel squirrel feeder will do just that. 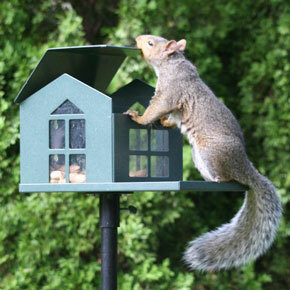 Set this attractive feeder as far from your bird feeders as possible, load it up with peanuts and watch the squirrels. The feeder is made with 18-gauge steel for the ultimate durability. 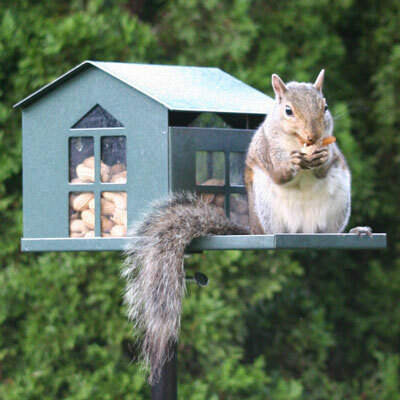 Unlike wood and plastic feeders, the Food Pantry Squirrel Feeder cannot be chewed and easily outlasts wood and plastic feeders. The feeder includes a back plate and all the screws necessary for easy mounting to fence posts or trees. Made in the USA. Holds approximately 2 lbs. of food. L12" x H7". Weighs 4.7 lbs.